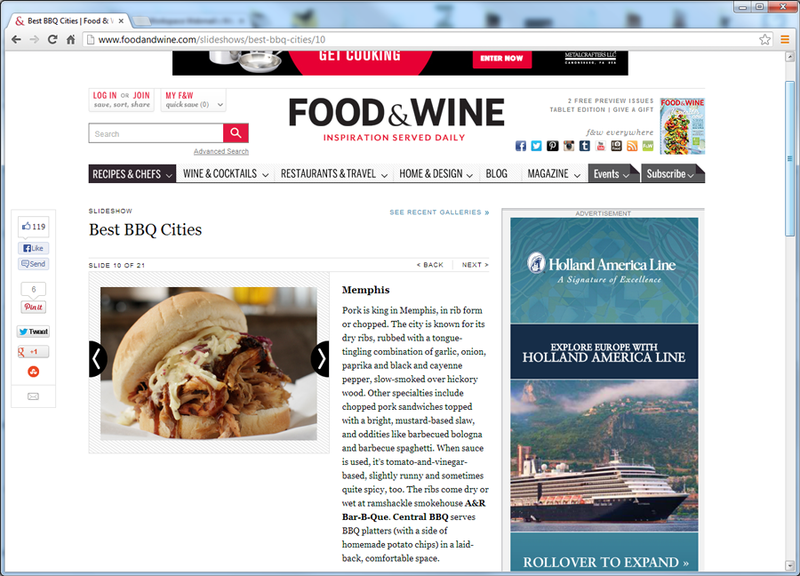 Featured On: FoodAndWine.com – Best BBQ Cities › Welcome the A&R BBQ Website ‹ "Any One Can Put The Heat To The Meat, But Only A Few Can Barbeque"
Pork is king in Memphis, in rib form or chopped. The city is known for its dry ribs, rubbed with a tongue-tingling combination of garlic, onion, paprika and black and cayenne pepper, slow-smoked over hickory wood. Other specialties include chopped pork sandwiches topped with a bright, mustard-based slaw, and oddities like barbecued bologna and barbecue spaghetti. When sauce is used, it’s tomato-and-vinegar-based, slightly runny and sometimes quite spicy, too. The ribs come dry or wet at ramshackle smokehouse A&R Bar-B-Que. Central BBQ serves BBQ platters (with a side of homemade potato chips) in a laid-back, comfortable space.